Wizi is free location based sharing (LBS) app which allows you to send to your friends and family your location on a map via SMS, Email, Twitter and Facebook. To be exact, Wizi is more like a location sharing social tool because you can not track your friend and show his/her movements in real-time on a map, but it’s quite simple. If you have a GPS enabled cell phone, it can determine your current location, and you can set your location on the map manually as well. 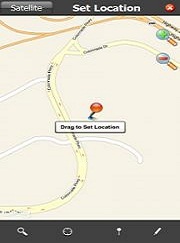 As it is using GPS, WiFi and nearest cell tower to find your location, it’s quicker than other GPS tracking apps. After that it will generate a URL to your location (you can add your address and coordinates), and you can send the URL via SMS from your mobile phone to your friends and associates, they will be directed to Wizi website and showed your location on a map once they click on the link. In addition, you can do the same on your computer, but this time you can send the URL via Email, twitter and Facebook etc. In the meantime, you can copy the URL to your clipboard and paste it to anywhere you like. Wizi now is available for Android, Blackberry, iPhone and Windows Mobile phones. Just type get.wizi.com into your address bar of your web browser on your cell phone, and you can start to download their app, and it’s totally free. And your can sign up with them to get your personalized URL.